For some people playing for a title worth half a million dollars, they'd be sure to get as much rest and relaxation as possible going into the final table. Ashton Griffin isn't one of those people though. Griffin openly admitted to being a little nervous about the final table and that he didn't want to try and get a few hours of sleep and risk not waking up in time. So instead, Griffin fired up some online poker tables and went at it. He had intended to just ease some nerves before the big day today, but ended up playing right up until the early afternoon today when he needed to head to start the final table. "It may not be the ordinary way to do things, but I'm not that ordinary," said Griffin. Despite numerous naps during breaks and dozing off between hands, Griffin was able to battle through a very tough final table before finding himself heads up with Hoyt Corkins. Heads-up play last only a couple of hands before Griffin and Corkins got all in both holding top pair. Griffin had the better kicker and it held strong to the end. For his win, Griffin took home a total of $560,000. It breaks down as $75,000 for winning his first table, $30,000 in bounties, and then $455,000 for first place. Not a bad day's work. 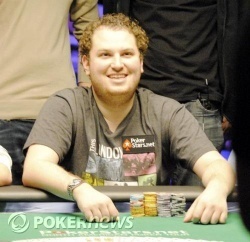 Scott Seiver was the player who earned the most bounties and that scored him a win of $100,000. With $75,000 for winning his table and $40,000 in bounties, that adds up to $215,000 total. Seiver won all of this, but only managed to come in fourth place at the final table. Here's how the final places at the final table look and all the money each player earned. That wraps up all of our coverage from the 2010 PokerStars.net NAPT Venetian. Until next time, this is the PokerNews crew signing off! Wow. After several hours of slow action, heads-up only lasted two hands. Hoyt Corkins raised to 18,000, and Ashton Griffin called. The flop came out . Griffin bet out 32,000, and Corkins popped it to 100,000. Griffin swiftly moved all in, putting Hoyt to a decision for his tournament life. Corkins had spent several minutes pondering every decision up until this hand, but it didn't take him very long to call all in. He tabled for top pair. He wasn't pleased to see Griffin roll over for top pair with a better kicker. The on the turn changed nothing since a six would make Hoyt a straight but give Griffin a higher one. The river was the , sealing Corkins' fate as the second-place finisher. 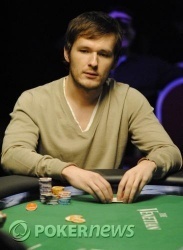 Corkins earned $25,000 for the five bounties he picked up along with $75,000 for making it to the final table. He's already chewing on a cigar at the payout desk. Scott Seiver made $100,000 with Cassidy's bust. Since it was Ashton Griffin and not Hoyt Corkins who eliminated Joe Cassidy, Corkins can no longer catch Scott Seiver in the race for the most bounties. With eight eliminations on his record, Seiver has locked up the $100,000 bonus that was added to the prize pool by PokerStars. He'll have to wait to collect it as he's been home for a few hours preparing to head to Los Angeles first thing in the morning. 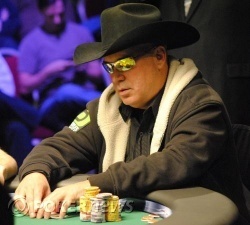 Joe Cassidy open shipped from the small blind for his last 89,000. Ashton Griffin called from the big blind, and they were on their backs. The board ran out , giving Griffin a pair of nines to eliminate Cassidy. 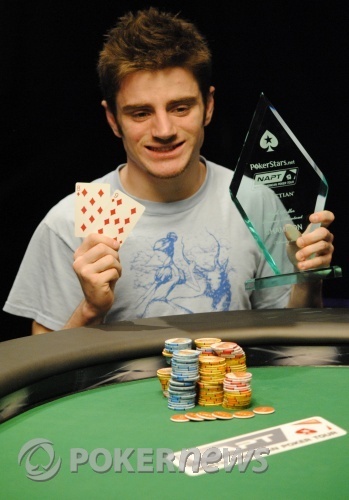 Joe earned $20,000 for the four bounties he collected and $75,000 for winning his first-round table. There is now a brief pause while tournament staff color up some of Griffin's chips and the tv crew prepares for heads-up play. Joe Cassidy raised to 14,000 and then Ashton Griffin reraised to 39,000. Cassidy called and the two players took a flop of . Griffin fired 14,000 and Cassidy folded. Ashton Griffin raised to 13,000, and Joe Cassidy called, taking us to the first flop we've seen in a while. Flop: - Both players checked. Turn: - Cassidy bet 17,000. Griffin raised to 56,000, and Joe released his hand. So there is one special railbird supporting both Joe Cassidy and Ashton Griffin. Every time either one of these players does so much as reach towards their chips, he cheers for them. He's an example of how it goes. Announcer: "Ashton reraises to 40,000." Fan: "Chuyeah! That's young money right there! Young money!" Announcer: "Everyone folds and Ashton wins the pot." Fan: "Young money in the building! Young money! Ch-chuyeah!"